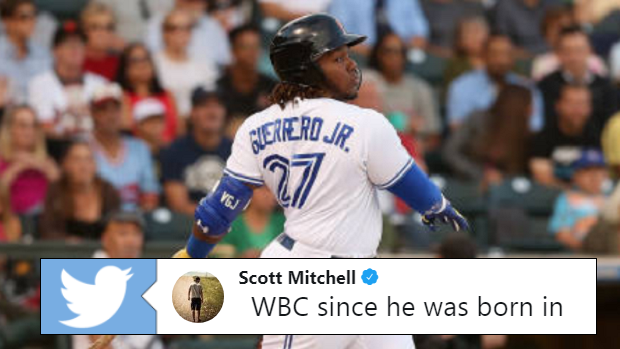 Vladimir Guerrero Jr. impressed Canadian baseball fans with his eye-opening play in the minors this season and is now doing it with his voice. The Blue Jays’ top prospect is taking care of business at the Arizona Fall League, rocking a .352 average while smacking 25 hits in 17 games. But his most memorable moment so far came off of the field in the form of a singing lesson, where he was captured learning how to sing O’ Canada. It made for a pretty special moment. When Canadians thought they couldn’t love this guy any more! Funny enough, Guerrero Jr. was actually born in Montreal while papa Vladdy was smacking dingers for the Expos. Can you imagine this guy reppin’ Canada at the next World Baseball Classic? Not a bad addition if you had to ask us! Vladdy Jr. could be chanting O’Canada ahead of every game in the near future, so he's got plenty of time to figure the rest of the words out.